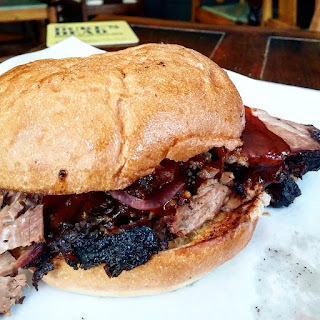 This June Prairie Fire BBQ - authentic Kansas City style BBQ - is in the kitchen at The Duke's Head in Highgate. I was blown away by the meats and tacos when I went last year - don't miss them this time. Open from noon seven days a week until Sunday 2nd July 2017. "Prairie Fire BBQ was founded in 2013 by Michael Gratz, a native of Kansas City and St. Louis. Michael moved to London and instantly fell in love with the culturally diverse food scene but missed the authentic, slow-smoked Kansas City style BBQ from his home town. He started making batches of his sauce, rubs and smoked meats for friends and family. After much encouragement, he decided to start selling his products at various markets around London, hence Prairie Fire BBQ was born."